The fall of General Electric (NYSE:GE) has been a headline-grabbing event. With recently hired CEO Lawrence Culp making hard calls to improve the balance sheet and right the industrial giant's ship, it increasingly looks like GE could have material recovery potential. After all, with the stock down around 90% from the highs it reached in the late 1990s, there's got to be upside here...Perhaps, but don't overlook the very real risks GE and its shareholders still have to face. 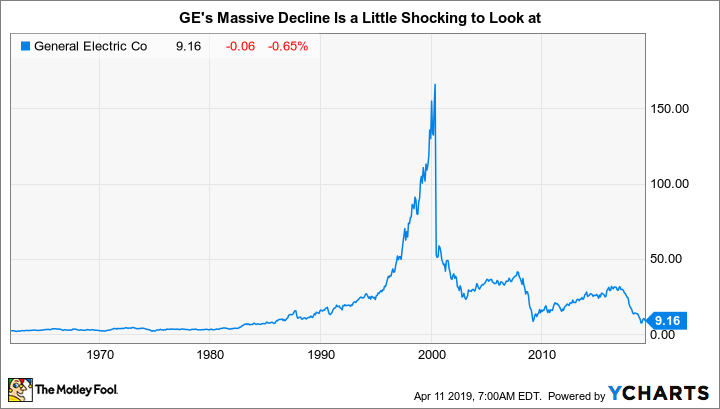 The first thing investors need to understand is that GE today is not the same GE it was when its stock was trading at over $150 per share in the late '90s. The drop to recent prices around $10 covers a lot of ground, including the deep 2007 to 2009 recession. That financially led downturn forced GE to jettison assets, such as its media businesses, and started a major shift away from what was once a giant financial operation. The most recent round of troubles, meanwhile, have led the company to divest even more operations, including its transportation business (iconic for making locomotives) and parts of its healthcare division, among others. Simply put, General Electric is no longer as large and diversified as it once was. And, equally important, it isn't done with all of these changes. For example, the $21 billion sale of a piece of the healthcare operation to Danaher isn't complete yet. And that deal is important because it is expected to provide the highly leveraged industrial concern some much needed breathing room on its balance sheet. Prior to that deal, there were very real concerns that GE was selling assets from a position of weakness. The healthcare deal has even led some industry watchers to call an "all clear" on the leverage front, but that won't really be true until the sale closes. And, then there's the not-so-subtle issue that part of GE's leverage problem stems from its finance division. That division's $43 billion in borrowings at the end of 2018 was materially larger than the $32.3 billion in borrowing attributable to the company's industrial operations. The bad news out of this division, which seems to have been a surprise to even GE management at times, has been a major headwind. At this point, it's hard to have any confidence in the belief that the troubles in the finance arm are over. And, on top of all of this, the company still has to deal with material retiree benefit obligations. General Electric does operate some pretty desirable businesses. For example, in 2018 the aviation division boasted a profit margin of 21.2%. The healthcare business posted margins of 18.7%. And the transportation business had a profit margin of 16.2%. The problem with that last number is that GE merged its transportation division with Westinghouse Air Brake Technologies, also known as Wabtec, earlier this year. It retains an equity stake in the combined entity, but it has agreed to sell down that stake over time. And don't forget the sale of a piece of the healthcare division to Danaher noted above, what remains is still a great business for GE, but the company basically raided the crown jewels to help stave off bigger financial troubles. So GE has a couple of strong businesses to work with, even if it needed to sell off a piece of one to give itself some breathing room. The problem is that it's going to need to lean heavily on aviation and healthcare because the rest of the company isn't exactly hitting on all cylinders. The finance division's troubles are pretty well documented, and it's hard to tell if this opaque business is getting better or it there's more trouble to come. GE's power division, its second largest by revenue in 2018, lost money last year, and there's no clear sign of a turnaround. The lighting and renewable energy divisions, meanwhile, had meager profit margins of 4.1% and 3%, respectively. Essentially, outside of aviation and healthcare, what's left of GE is struggling. And there's no quick fix. Getting power, lighting, and renewable energy operating at a higher level will take time. In fact, CEO Culp recently surprised the market when he said that GE was going to have negative free cash flow in 2019. Basically, the company is going to be spending more cash to fix itself than it generates. So this will be, at best, a transition year for the industrial giant. With all of this bad news, it would be easy to dismiss GE as an investment. And, frankly, conservative investors probably should. There are still very large risks here and a lot of uncertainty. This is a turnaround situation -- and turnarounds generally require investors with very strong stomachs. That said, there is real recovery potential at GE, if it can build on the strength of its aviation and healthcare businesses to turn around what's left of the company after all of its divestments. The problem is that the potential upside isn't likely to be worth the risk for most investors at this point.